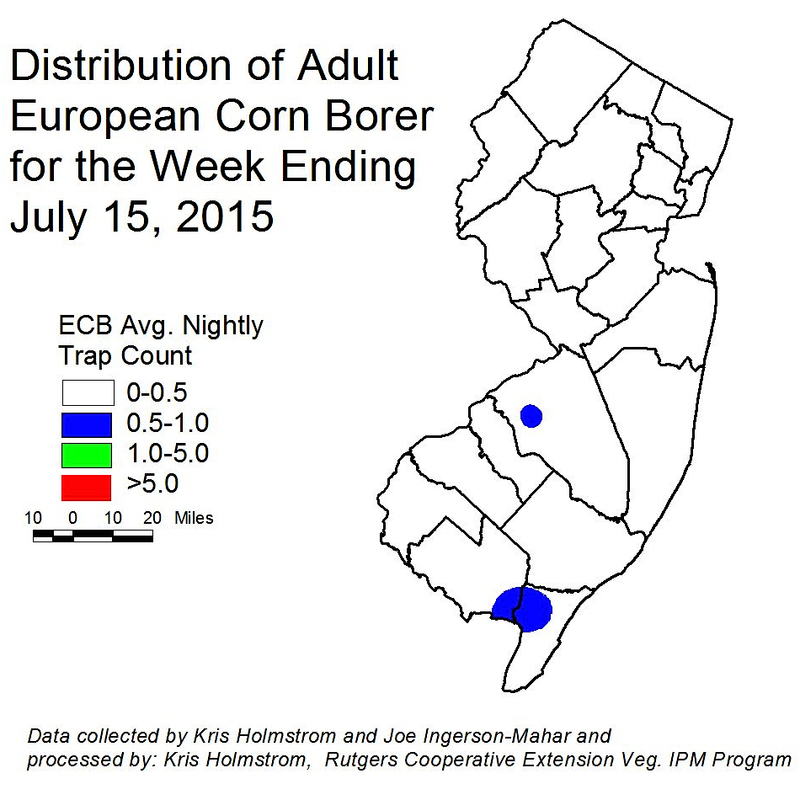 There is still very little European corn borer (ECB) adult activity at this time. 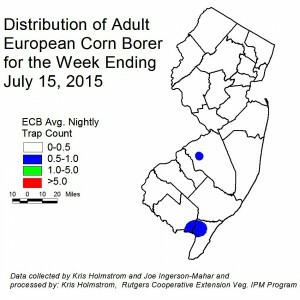 Few individuals have been captured throughout NJ this past week (see ECB map). ECB infestations are absent from sweet corn plantings. We would expect to see signs of the second flight within the next week or so. There has been a modest increase in catches of corn earworm moths (CEW) in blacklights this past week. Overall activity is still low, and is primarily in Gloucester County and areas to the south (see CEW Map). Catches in states to our south are still low. Increases in the lower mid-Atlantic trap catches will be monitored and reported here in order anticipate increases in NJ. The limited CEW pheromone trap network in the southern counties has captured moths at a rate similar to the previous week. Western Salem and the Atlantic-Camden County border area have the highest activity (see CEW pheromone map). The low number of traps results in broad areas of color within the map. It is critical that growers monitor local CEW moth numbers. At present, light-to-moderate silk spray schedules should be adequate to limit CEW injury as well as to prevent ear damage from ECB or FAW larvae that already inhabit the stalks. Low level fall armyworm (FAW) infestations continue to appear throughout NJ, with highest infestation rates (14%) found in Cape May County. Very few FAW moths have been captured in the region, so the threat of increased infestations in the near term seems low. However, this pest can be devastating to small corn plants. Fields down to seedling stage should be scouted weekly for signs of infestation. Recent weather has been conducive for the spread of the late blight. However, other than the two locations in central Morris County, only a very small infection was found near Belvidere in Warren County within the past week. Tomato growers should continue to protect all plantings against this disease, particularly while wet weather persists. 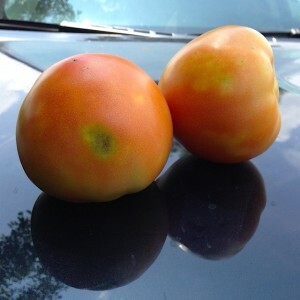 The strain found locally is US-23, and can infect tomatoes and potatoes, although no infections on potatoes were found near the affected tomato plantings. Consult the 2015 Commercial Vegetable Recommendations Guide for fungicides effective against late blight. This week, tomatoes in Hunterdon County have developed fruit injury from stink bugs (see photo). In this case, the stink bugs are the native brown species. Stink bugs are extremely difficult to find in planting, and often the only sign of their presence is from fruit injury, called cloudy spot. Stink bug damage is typically worse during dry weather, as wild hosts become less available to the bugs. This causes them to move into irrigated tomato plantings. With this year’s wetter conditions, it is possible that damage will be minimal. However, if fruit injury is discovered in increasing numbers in the field, or in harvested units, growers may wish to apply insecticides to limit further damage. Consult the 2015 Commercial Vegetable Recommendations Guide for insecticides effective against stink bugs. Bear in mind that these insecticides are broad spectrum, and may result in increased aphid or mite populations. 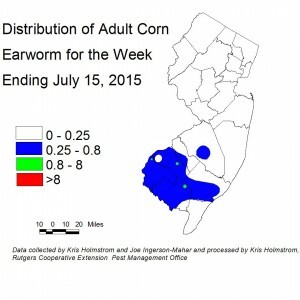 BMSB numbers remain low in NJ blacklight traps this past week. These catches are too low to create a map. As yet, no fruit injury has been discovered in scouted pepper plantings. The cucurbit downy mildew forecast has NJ at high risk of infection from reported infection sites in neighboring states. As yet, there are no reports of DM in pumpkins and winter squash. No DM has been found at Snyder Farm to date. Although basil downy mildew (BDM) has been reported from southern NJ, the BDM sentinel plot at the Snyder Research and Extension farm is still free of the disease. 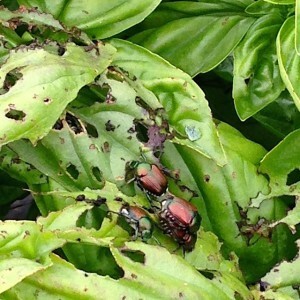 Japanese beetles, however, are devastating the plots (see photos). Growers should monitor basil plantings regularly to make sure these pests are not causing extensive damage at this time. 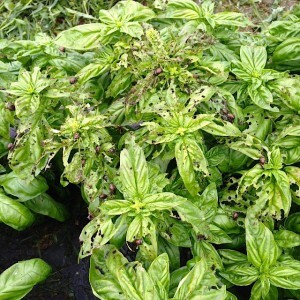 Basil with devastating Japanese beetle injury.